OwnerRez has always been about user flexibility and not locking you into one way of managing your vacation rentals. This is why we've never forced you to use our credit card processing, forced you to show our branding on your guest-facing emails or forced communication through our channels. We want you to build your own brand and control your own booking process. To that end, it's always been one of our highest goals to support a diverse range of payment methods so that you have lots of competitive options. Previously, if you wanted to collect credit card payments you had to have a merchant account with Authorize.Net, PayPal Payments Pro or Sage. Those were the three gateways we supported. To start using one of these gateways, simply navigate to your payment methods area and click the Add Payment Method button. You'll see the same page as before only with many more options. These gateways were selected for integration based mostly on requests from users who had existing merchant accounts and didn't want to switch to something new. We've been collecting requests from users about payment gateways for more than a year. They were also selected based on the features they support. For instance, any gateway that we integrate with must support at a minimum Sale, AuthOnly, Capture, Void and Refund transaction types. We also require a certain level of encryption and a history of speed and reliability. Canadian users should take note of Beanstream, PSiGate and Braintree. 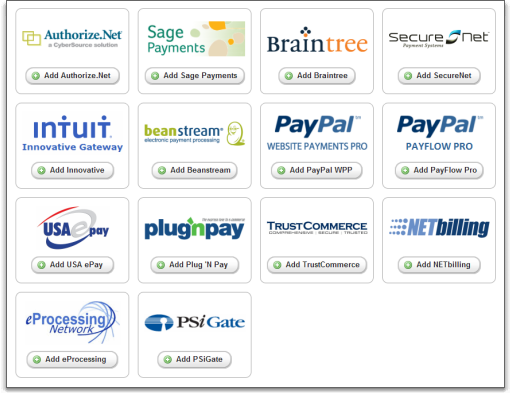 These gateways, among others, offer Canadian merchant accounts that are capable of native Canadian Dollar (CAD) settlements. Payment gateways allow OwnerRez to collect payments and reserve security deposits through the built-in payment forms that we offer. However, many internet users prefer to pay for items using third party websites such as PayPal, Google Wallet (formerly called Google Checkout) or their Amazon account. This increases security and eliminates having to enter billing information for every website one visits. We are planning on integrating with these websites in the future so that you can offer them as an additional payment method to your guests. Scheduled items, such as the second payment or security deposit, won't be processed automatically, but the guest will receive reminders so that they can go online and use the payment website again. If we missed a payment gateway that you prefer, or there's a different method of payment you'd like to offer your guests, please let us know. We're constantly adjusting our development priorities as we hear from users and see what works. I have a gateway but it is not listed. Can I still use this or do I have to set up a new account with one of the 11 accounts you list? This post is pretty old -- we're up to 20 gateways now: https://www.ownerreservations.com/support/articles/payment-methods -- is yours any of those? If not, which gateway is it? Sometimes a processor will support other gateways like Authorize.Net or eProcessing Network and/or they have different named gateways. So... this might be a sensitive question ... but what is the consensus of the best gateway to use? Does anyone have any favorites? Right now I am using Sage (I think a long time ago when I joined Ownerrez I was able to use it free if I used Sage payments). if you go on their 'virtual terminal', it is pretty much that... a old terminal dump bolted onto a web page ... it seems like. I want to change my bank account that receives $ but the interface is so poor, there is no guidance on how to do that. I am wondering if there is a better gateway out there? Maybe one that has an interface that is not 1980's style? Anyone have any preferences?